Sterling Audio puts out some really decent microphones. The ST51 is really affordable and sounds great. 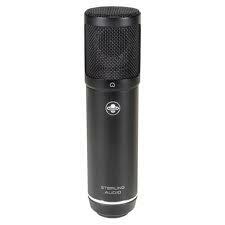 It is a large capsule condenser microphone that gives a really clear and warm sounding vocal recording. It really thrives with acoustic instruments as well. When I brought it home, I did an acoustic guitar recording and I was really impressed with the clarity and bass response. Later that night I recorded a Hip-Hip artist and his vocals were really clear and loud. Excellent response from this microphone and it sells for only $100 at Guitar Center. Click the link below for an exclusive deal.